Regular readers of this blog (yes I know I have been irregular of late in posting) will know that I have been working on elaborations of the various Cynefin domains. So far I have split disorder into authentic and transitionary and looked at the complex domain from the perspectives of coherence and consensus. In respect of the latter, in presentations and teaching I am moving the earlier model rather the rotated one and also focusing more on coherence. Its probably worth checking the links before reading on. Simple order is placed next to chaos as complacency leads to catastrophic failure. mixing the scientific use of the term (namely randomness), with common use which is generally about disorder and confusion from the perspective of the observer. conflating complexity with chaos, for example traffic patterns in Indian cities appear chaotic, but are in fact complex; constraints exist, patterns form. wanting to make chaos the mysterious and exciting part of a two my two matrix, something which appeals to the un-reconstituted anarchist. The first two are more than legitimate and any confusion can normally be resolved by explaining the different use of language. This makes it possible for some one to say something along the lines of In Cynefin this would be considered complex while continuing with the common use form. The third I find more problematic especially when people start to claim status as magicians in order to handle it (I do not jest by the way). Achieving all three over a sustained period of time in the face of evidence takes a special type of pertinaciousness mind you; but enough of that lets move on. The title of this post comes from Friedrich Nietzsche, whose philosophy has a lot of relevance in this field by the way. The full quote is: “You must have chaos within you to give birth to a dancing star.” I rather like that as chaos is one of the creative spaces, one where we can allow for the creation of novelty. It is also a space that entered catastrophically without warning can be fatal for individuals and organisations alike. Historically Cynefin has see chaos in two ways. The first manifestation was in Complex Acts of Knowing where the deliberate entry into chaos to break expert entrainment was a key aspect. The second was the development to two dynamics for crisis management namely single attractor stabilisation (impose order, shift to simple) and multi-attractor stimulation (create sufficient constraint that you can transit to complexity. Those two dynamics which were ever present in the early days of teaching were extended in the New Dynamics of Strategy to include the Masada gambit, a reference simply throwing oneself into chaos as no other strategy seemed viable. So Cynefin has also seen this balance between getting out of chaos, and deliberately entering into it. The main point is that it really is very very difficult to stay in chaos for any period of time. Wisdom of Crowds methods (more on that in a future post) require it and it's almost impossible to prevent constraints and connections coming into play. So Chaos is always transitionary but not in the same way as disorder. Enough of the background, the purpose of this post was to introduce a sub-model for the chaotic domain of Cynefin so here it is. It would be a lot better as a build then I could introduce it stage by stage but that is more difficult in written form. So let me explain it. I am following a similar form to the complexity sub-model here with two dimensions but with a weak grid to help understanding. 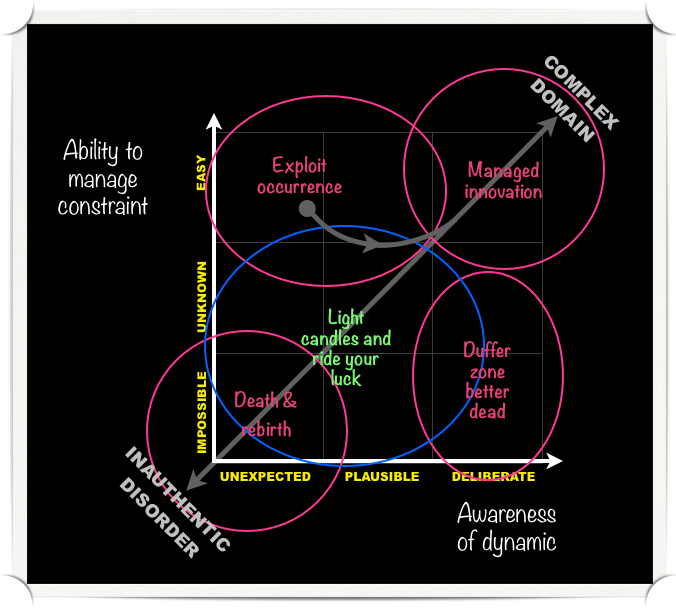 The vertical dimension covers out ability to manage constraints. If we can relax or remove the constraints with ease and then reimpose them then we are able to control the transitions between domains and our risk is reduced. If its impossible to reimpose once they are relaxed the we are in trouble so that gives us the two extremes with a state of not-knowing as the middle ground. In the horizontal we are looking at the degree to which we are aware of what we are doing if we move into the domain. At one extreme we do it deliberately (possibly with malice of forethought!) at the other it happens suddenly and unexpectedly and we will find it difficult to recover. Our middle stage, if we are adopting a resilient approach to strategy then we will have a strategy based on managing what is plausible, as well as the probable and the possible so we should not be unduly surprised. DEATH AND REBIRTH is the subdomain that one might describe as unfortunate. Any attempt to create constraints are impossible and it was completely unexpected. Collapse is inevitable, so in organisational terms you transit into the inauthentic subdomain of disorder. Of course something will happen as result, chaos does not last for long and you may survive. Again resilience is the key, but avoid any illusion that you are in control. MANAGED INNOVATION on the other hand is the old breaking pattern entrainment of experts. its border line complex, what I have called a shallow dive into chaos. It is a deliberate action and the reimposition of constraints is a safe-to-fail experimental criteria for action. EXPLOIT OCCURRENCE is all part of resilience. Creating constrains is easy bt entry was accidental or just plausible This is the sub-domain where I normally recommend that people have innovation teams ready to roll the minute any crisis hits; you never have a better chance to change things than in a crisis. THE DUFFER ZONE is when you deliberately remove all constrains with no idea whatsoever about what you will do. You deserve to die, and in the important words of the father of the Swallows: Better drowned than duffers if not duffers won't drown. LIGHT THE CANDLES is the fifth subdomain and overlaps with the latter three. You didn't expect to be here, you don't know what to do and you can only really prayer (my catholic background is showing in the title). This sub-domain needs further elaboration and its a holding label for the moment. OK, so that is the first thoughts, although it comes out of several months of playing with drawings. I'm publishing early these days so its bound to change. All and any comments welcome.